I am a minister, photographer, retreat leader, author and Quaker -- albeit one who's not always good at being a good Quaker. I am the author of "Awaken Your Senses," "Holy Silence: The Gift of Quaker Spirituality," "Mind the Light: Learning to See with Spiritual Eyes" and "Sacred Compass: The Path of Spiritual Discernment" (foreword by Richard Foster). This blog is a compendium of writing, photography, seriousness and silliness -- depending on my mood. Before I get to my proposed name change, let me say just a bit more about why I think it's time for a change. I'll make it explicit -- and that is the idea in the minds of many (primarily programmed Friends) that minster is synonymous with pastor. And that tain't necessarily so -- or at least it shouldn't be. We Quakers have long recognized various gifts of ministry. But this creeping clergyism is too quickly leading to the inevitable (I think) conclusion that the only ministry that is recognized is that of pastor. That's already happening in some places. I live within the geographical confines of one yearly meeting and am a member of the yearly meeting "next door." I am a congregational consultant, which I consider very much a ministry. Yet, because I am not a pastor, I am not included in any mailings for ministers -- other than the yearly report I am asked to complete to demonstrate that I am using my ministry gifts. I am not invited to Pastor Short Courses, luncheons, retreats, information/training sessions, etc. It is as if, even though I have been a recorded minister for 30 years now, that I am not considered a minister by these yearly meetings since I am not a pastor. I know I'm not the only recorded minister who has experienced this. Another thing I worry about is, if we start using the title "Pastor" can there be a "Bishop" (in name or action) far behind? I fear we are closing in on the attitude, if not the title, already. And this goes against our call to present the Gospel of direct communication with God without a need for rite, ritual, or clergy. So what do I propose? I have thought a long time about this and here's my ungainly name -- "released minister." I think it's a good name for a number of reasons -- two of which I'll address here. One is that it gets us back to the idea of what we name all Friends. We are all ministers, are we not? Or at least we're supposed to be. Let's start by calling our paid staff person by the same name we all need to be going by. Another is that this name will have to be explained. If, upon meeting somebody for the first time and they inquire about how I spend my days and I say that I am the pastor of Podunk Friends Church, they immediately know what that means based on their experience of what a pastor does. But if I say, "I'm the released minister at Podunk Friends" then I have, as Desi Arnaz used to say, some 'splaining to do. I then get to tell how we Friends believe that we are each ministers and that I am fortunate enough to have been released from seeking full time secular employment to use my ministry gifts in the service of the other ministers. I think that can be a powerful witness. I think it also gives other Friends a chance to witness -- and relearn -- the amazing fact that we are all ministers. If we aren't allowed to say "She's our pastor" anymore and say "She's our released minister," then it is, like above, an opportunity to say what we believe about ministry and why. Which means, of course, that Friends need to be educated enough in our Gospel message that they can articulate it. Another thing I think this title could help us do is to focus on what are we calling a staff person to come do for and with us as a local congregation. We could then move from some boiler-plate job description of pastor handed down by a committee from the Yearly Meeting to developing a position that meets our needs. We would then have to ask, what are we releasing someone to do? To preach? To visit the sick and dying? To teach us? What do we need done by a paid staff person that we cannot (not will not) do ourselves? This then allows us to match the person and her or his gifts with the Meeting and its expressed needs. It is not about developing a professional quasi-clergy profession where congregations advertise for a pastor and everyone's resume looks the same because the job has been the same from location to location. What a joy to match gifts and strengths to a people and place that can make use of them in unique ways. It also allows us to recover the Friendly idea that there are many types of ministry. A large Meeting might have released ministers serving as pastors, youth ministers, pastoral counselors, chaplains in local institutions and more. No one is senior pastor versus junior pastor -- all gifts and people are equally respected. I think the title "released minister" is one that could be used for paid staff in unprogrammed meetings, too. It is no less arcane, and certainly more descriptive, than titles such as Meeting secretary. Notice in this idea of the name change, I have nowhere advocated for an end to paid and/or trained ministers. While Friend George did say that "being bred at Oxford and Cambridge did not qualify or fit a man to be a minister of Christ," it doesn't necessarily hurt, either. I think we Friends can be well served by women and men who are trained in congregation administration, religious education, preaching, counseling, and the like. And if a woman or man feels called to serve Friends full time and her or his gifts in ministry are confirmed by the Meeting or Yearly Meeting or whatever, then she or he should be compensated. Yes, this may all seem to be a bit idealistic. If so, I plead guilty. And yet, it seems to me, that the Quaker message is an idealistic one -- a Gospel that calls us -- and expects us -- to experience God individually in community. Our paid staff people should be empowered to help us keep to that ideal through various ministry roles. To be a released minister -- instead of pastor -- would be, I think, immensely freeing. If, that is, one truly cares about being a Friend of Jesus and not about being in a position of power or titular authority. I think "released minister" is a great descriptive phrase for the position. However . . . It runs into the same difficulty we face by being a "meeting" rather than a "church." People outside the circle don't know what we are talking about. I can hear the wheels in people's heads turning . . . "Let me see if I got this right? You're a dating service run by recently paroled felons?" I think enough people are familiar with the word minister to get the point. I'm not sure which denominations currently use the term minister, but in my mind, it connotes religious service. I like it. I want that job title. And I want the kind of job description you outlined that would go with that title. But then I'm in a yearly meeting that doesn't even record its ministers at all, so that's a big leap from the other direction for us. But I know there are a few Friends in other unprogrammed yearly meetings who have been released by their monthly or yearly meetings for this kind of service. Really, we need more of them, and I think there are plenty of candidates for this work. What I'm not sure is whether there are enough Friends in unprogrammed meetings willing to pay to release someone to minister to them. Hmmm...does this explain my missing comment about "Released Friends" from several days ago? I think you are right on the money- great suggestions! I wouldn't break the Discipline and bet the ranch on this monicker catching on. In my home YM we have used "Released Friend" a few times, tho with difficulty. Part of the difficulty is an issue you're eliding here, Brent. It is that in the FGC (& Independent Liberal) stream, by 1926, the whole notion of "recording ministers" (paid or unpaid) was decisively rejected, after a long struggle; ditto in the UK, on the ground of maintaining a formal stance of equality within the RSOF. It is a melancholy fact that few FGC/Independent Friends are aware of this history, but nonetheless a great many bring a rather fierce attachment to this notion of equality with them to Friends, and they're not going away. Hirelings we have learned to put up with, more or less; "recorded ministers" are a flash point. This background has made all the issues around hirelings (the term I prefer, if only for its lack of elegance or imputed status) very tangled and fraught, more visibly in the Liberal & Independent branches, but also among the pastoral groups. There are some neo-Conservatives resident among the Liberals who are trying to bring back recording and all its paraphernalia; as this agenda becomes more explicit, I think it will encounter more stubborn opposition than it already has. And my visits to the large pastoral YM nearby suggests that the institution is under increasing internal pressure there. with a very cloudy prospect. I thought a lot about what term to use for my proposal and settled on "released minister" because to me it spoke more to what I was proposiong than did the term "released Friend." That's a term I've hear before and while I have no objection to it, it seems a bit vague. Released for what? I want to recapture this sense that we are all ministers -- and hence each bear responsibility for the quality of ministry that occurs in our meetings, programmed or not. So I am a bit unsure which meaning of eliding Chuck is thinking I'm doing. I'm assuming it's "to leave out of consideration" but I disagree that I am eliding in that way. I am aware of how the recording of ministers has fallen out of favor and into disuse among certain branches, even if I did not articulate that. My proposal then was, by implication, that it should be restored ins spite of years of disuse. I would argue (perhaps I should say posit -- sounds Friendly-er and less war-like) that recording should move out of the hands of Yearly Meeting committees and back to local Meetings. Encourage local Friends congregations to recognize those among them who exhibit gifts of ministry -- and empower them to exercise those gifts. I dislike the term hireling for a number of reasons, not least of which is its historically perjorative nature within our society. But mostly I dislike it because it is not at all description -- other than implying a person's role is defined not by what she or he does but rather because he or she takes money to do it. To call me a hireling of the Center for Congregations, while accurate in the sense that they pay me to drive to this office daily and do work, gives no indication of what I do -- work I feel called to. I'm a Quaker who's just not very good at being a good Quaker -- I'm not always who aren't always peaceable, humble, kind, loving, truthful like someone who is a Friend should be. I'm also an author, minister, retreat leader, and photographer and I live in rural Indiana. Over the Rhine -- Great Music! 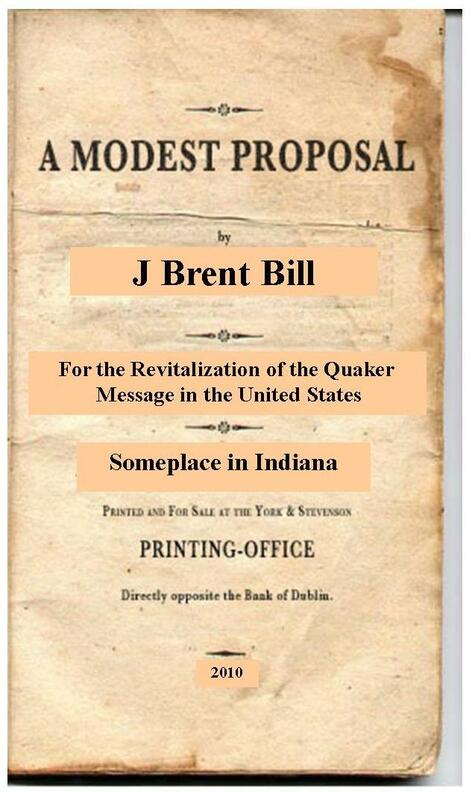 Are You A Quaker? Take the Test! Holy Ordinary: Brent Bill's Blog by J. Brent Bill is licensed under a Creative Commons Attribution 3.0 United States License. J. Brent Bill, all rights reserved. Watermark theme. Powered by Blogger.